The summer season is now well underway. It is a time of year that Team TME loves as it invites to escape to the beach or satisfies our wanderlust with a fabulous vacation to an unknown land. Summer has is own solid uniqueness of endless possibilities. 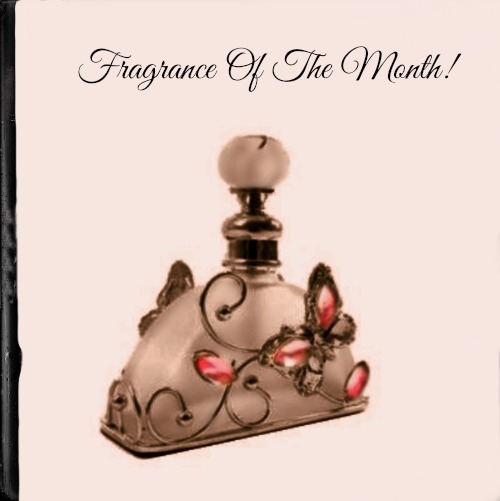 With the magical inspiration of the season, we chose an exquisite and upscale parfum for Fragrance Of The Month July 2016 -- Clive Christian No. 1 for women and for men! Each fragrance is spectacular, and combined with the bottling that received the UK FIFI award for special packaging in 2006, No. 1 is the representation of dreams. 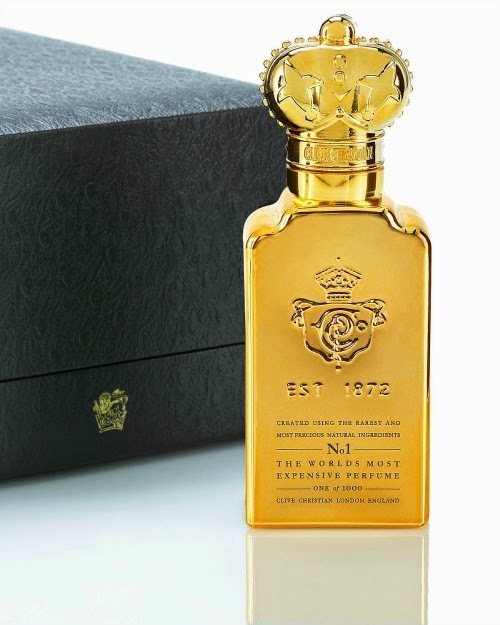 The bottles for both scents are painted in gold! In 1999 Clive Christian acquired the Crown Perfumery, a celebrated British perfume house established in 1872. 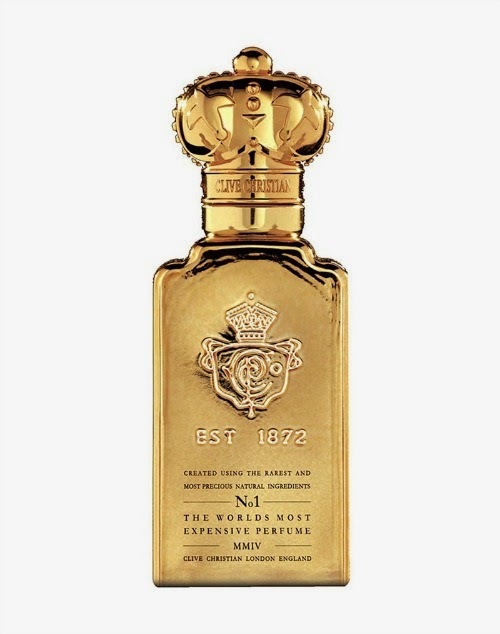 The house acquired its name after being granted the use of the royal crown by Queen Victoria as a mark of quality and excellence, the design of which is used as the topper for each scent. Clive Christian No. 1 for Women (50 ml - $865) opens with a warm masterful blend of fruits that envelope the seductive notes of jasmine and ylang-ylang. Evolving into a touch of sweetness with drydown seamlessly marrying precious notes and leaving one surrounded in cashmere-like comfort. Clive Christian No. 1 for Women Perfume is serene, sophisticated and undeniably feminine. The scent classification is Oriental Floral. Season: All ; Sillage: 3-Moderate; Longevity: 4-Long Lasting; Bottling-5. Clive Christian No. 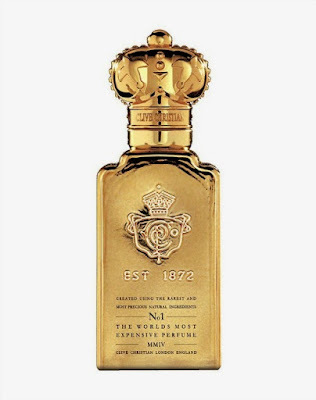 1 for Men (50 ml - $865) is similar in essence to No. 1 for Women in that it is an Oriental theme (Oriental Wood to be exact), but this fragrance is very much a gentleman’s scent. Opening with a crisp blend of warm fruits, No. 1 for Men quickly gives way to its mid notes with a predominance of jasmine and ylang ylang with dry down settling softly into a masculine woodsy essence. Season: All Seasons; Sillage: 4-Heavy; Longevity: 4-Long Lasting; Bottling-5. Clive Christian fragrances are available at Saks and Nordstrom stateside and to find a global retailer, visit Clive Christian. Now, if you’re seeking a less expensive or different themed fragrance visit The Makeup Examiner’s Fragrance section to find one that’s right for you!